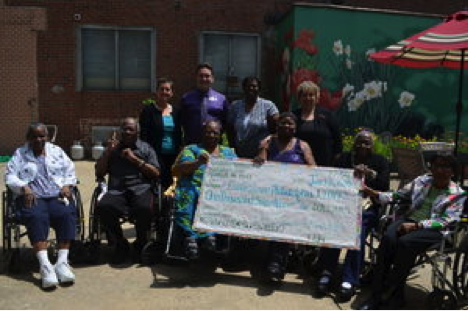 Seniors from West Philadelphia’s Renaissance Healthcare and Rehabilitation Center donated more than $1,000 to neighboring shelter, Families Forward, earlier this month. The seniors, nine men and women, raised the money with a Dance-A-Thon they hosted on June 3. The money raised will be used to support after-school programming for youth at the Families Forward shelter. The $1,017 that the seniors gave pushed Families Forward closer to its $15,000 goal. At press time, they’d raised $2,800. Timothy McCracken, the Renaissance Director of Recreation Services, said they’ve donated to Families Forward before. In 2013, they gave school supplies to the youth. He said the center encourages the seniors to stay involved with the community. McCracken said the Dance-A-Thon was a two-hour plus marathon that included such dances as the Wobble and the Cupid Shuffle. Some of the seniors got their hair and makeup done before the event and when they arrived, the dance room was decorated with disco lights, a fringe curtain and a VIP area. In order to dance with the seniors, participants had to pledge a donation. The seniors also solicited donations a full week prior to the event, from friends, families and staff.